“Normal” is a sense of familiarity that guides each person’s life in a different way. What one person finds to be typical can, to another, appear entirely extraordinarily. Normal is a concept that brings comfort, like a warm blanket, lending us a sense of what is safe and expected. But for some, like August’s Survivor of the Month, Janie Clay, the idea of what is normal can change dramatically when they expect it the least. For some people, “normal” will never again mean the same thing. 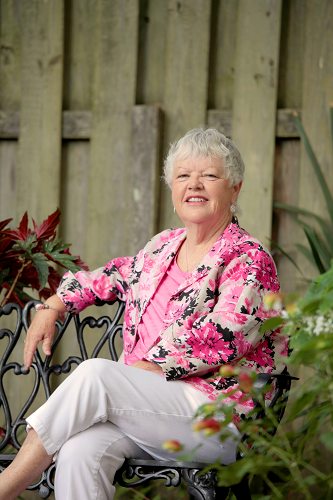 As the summer began to turn to autumn in 1975, cancer was a thought far from Janie’s mind. “My life was relatively routine, working at Southern Bell repair department, raising two girls, school activities and church activities. My husband and I worked together to have a normal family life. We were young, just beginning to understand the challenges of family and raising two little girls.” But life for Janie would soon take an unexpected turn, when she discovered a lump in her breast shortly after her 27th birthday. A challenge that many patients face early in the battle with cancer is simply understanding what to expect and how to move forward. “(With) two primary breast cancers four months apart at the age of 27, I look back on the experience and realize how uninformed and unprepared I was about cancer in general. I could not recall knowing anybody personally that had cancer. I had no one to talk to and there were few resources to go to for answers.” Today, Susan G Komen of Coastal Georgia provides a number of services that offer help to many, like Janie, who need support throughout Coastal Georgia. Providing breast health education and advocacy are two important ways that Komen seeks to give back, in addition to funding local programs for screenings, research, and survivorship support. During her battles, Janie would discover the critical role that survivors play in helping others who face the challenges of a fight against cancer. Without a close friend or family member from whom to draw advice, Janie would turn to a co-worker who was herself a breast cancer survivor. Through her first experience with breast cancer, she would learn that often the best medicine is strong support from someone who understands. “Strangely, I did not undergo radiation or chemotherapy treatments for my cancer. What I did get was inspiration from a survivor.” The relationship that she would build would eventually inspire her to invest her own time to give back, serving for years with the Reach to Recovery program in addition to serving as a steadfast administrative and race volunteer for Susan G. Komen Coastal Georgia. To this day, Janie continues to fight on despite years of frustration and setbacks. She is currently receiving treatment for a recurrence of the cancer that emerged in 1994. Despite this, she remains determined to win her fight and serve as a source of inspiration for all.